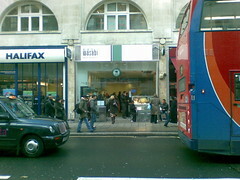 Pick and mix sushi/Japanese takeaway place on Oxford Street. This branch is takeaway only; there's nowhere to sit down. Last visited by secretlondon, June 2009. Opening hours taken from the Wasabi website, June 2009. Last edited 2009-06-08 13:10:04 (version 7; diff). List all versions. Page last edited 2009-06-08 13:10:04 (version 7).